Police say the vehicle crashed after failing to stop for officers. 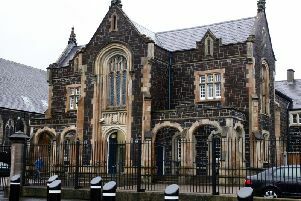 A driver is facing a series of motoring charges after a collision and police chase in east Antrim last night. Sgt Lowry, PSNI Larne, stated: “The vehicle made off from police when signalled to stop and crashed. Six persons made off on foot from the vehicle but all were caught after a short foot chase and the driver arrested for driving while unfit through drink or drugs, dangerous driving, no insurance, L driver unaccompanied and failing to stop for police.